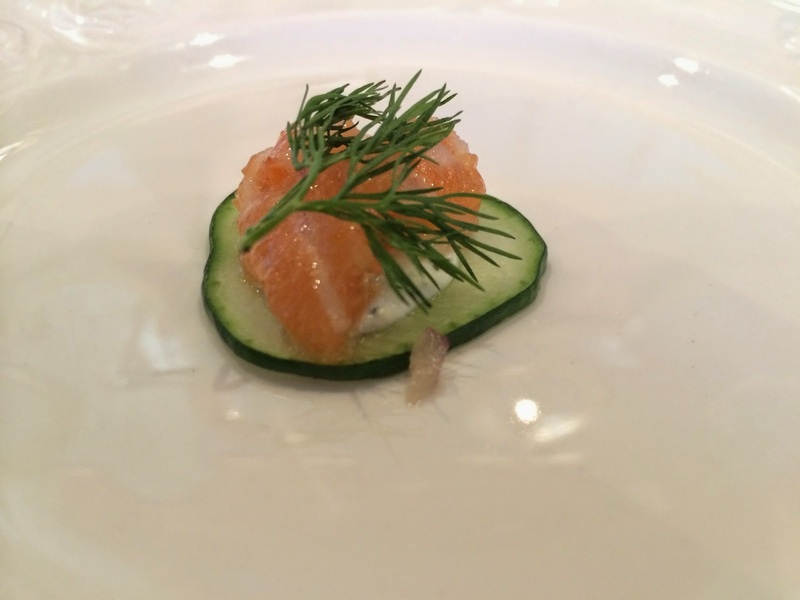 One of Rosebud's newest concepts is a seafood-inspired restaurant in the River North area. It was a bold move on Rosebud's part, trying to compete with several other seafood joints in that neighborhood, but I was glad to see the effort. When we gave it a try, the restaurant was absolutely slammed (surprising for a random Sunday night). Anyway, we decided on a wide array of seafood options to give Joe Fish a fair chance. The seafood appetizers and salad were a huge disappointment with way too much cream in one and way too much butter in the other. If I were you, I would stick with the Bang Bang biscuit. On the other hand, the whole fish was deliciously prepared and a dish I would actually come back for. The prices are steep and the service spotty. At one point, we waited nearly 20 minutes for our check and credit card to be returned to the table. That didn't even compare to the non-existent water once our first course arrived. The service is nice in terms of portioning out fish and other shared dishes. But that couldn't make up for the high cost, subpar appetizers/salad, and mediocre dinner service. So for that reason, I stuck with a 3-mile rating. 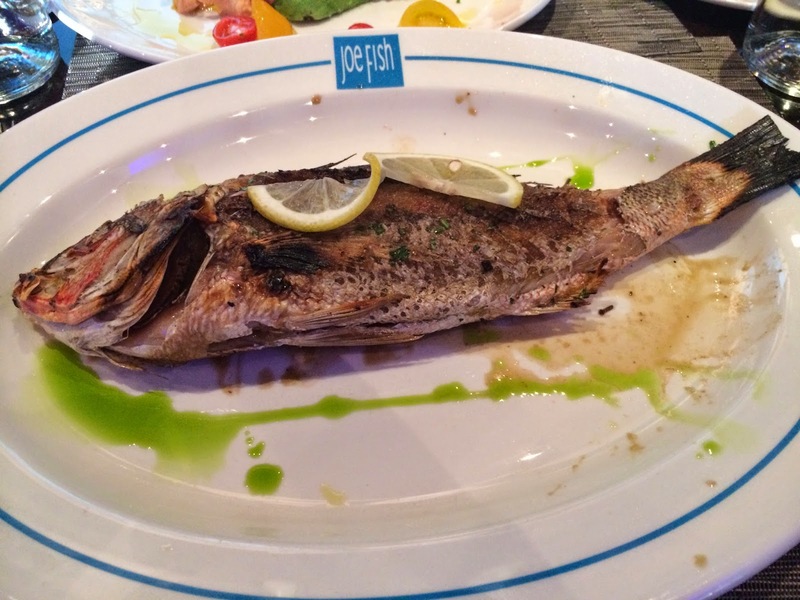 The fish really elevated my rating, so hopefully other people have better service then we did. As you may have seen in my post on Bang Bang Biscuit (I mean, Pie) Shop, I am a huge fan of these biscuits. In fact, I would walk more than 5-miles if I knew I had a platter of these rich, fluffy biscuits at the end. Joe Fish must have realized how great these are because they have decided to serve them as one of their appetizers. 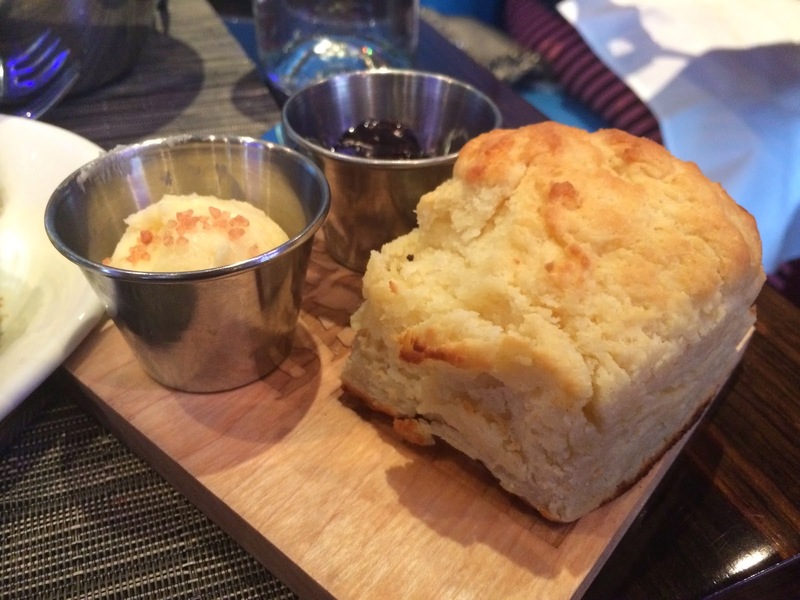 Here, the Bang Bang biscuit is served with a rock salt whipped butter and a mixed berry preserve. The biscuit comes out on a customized wood block with both restaurants named burnt into it. They should thank Bang Bang Pie Shop greatly because once again, this biscuit was the best bite of food I ate the entire night. I suggest pulling the biscuit apart into little pieces and adding both butter and jam. I prefer more butter with a little spread of jam to give it the sweetness. Incredible is an understatement... I need more of these! Ever since I had the opportunity to stay in New Orleans for over a month, char-grilled oysters have been one of my favorite appetizers. 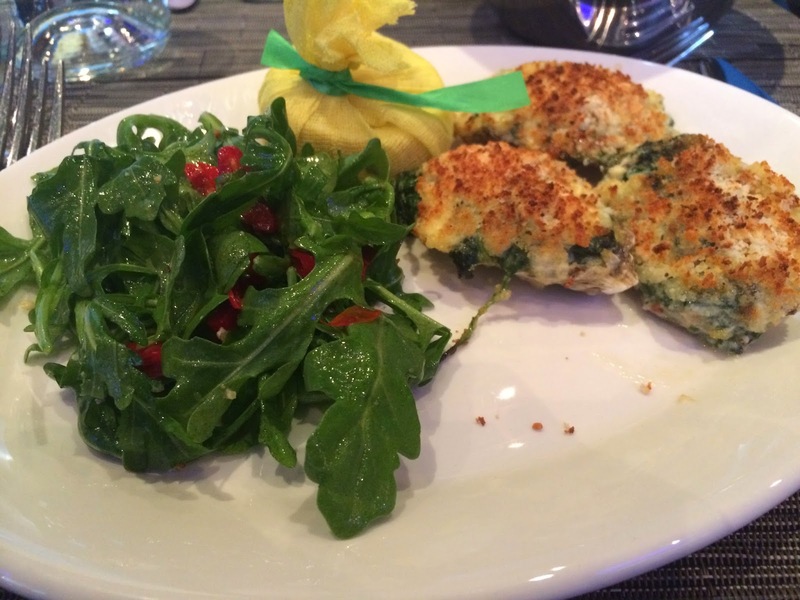 A very similar dish is a good oysters rockefeller. Here, the dish is an oyster topped with spinach, bacon, cream, and a hollandaise sauce. Bread crumbs finish off the dish before being warmed under a broiler. It comes with a side salad of arugula and red jalapeños. My first bite was delicious. Lots of bacon and rich cream flavor which was nicely cut by the freshly squeezed lemon juice and the smokey, yet spicy salad. I loved those jalapeños. However, I soon realized the oysters were essentially non-existent on the dish. You could easily just have a mixture of spinach and bacon served in an oyster shell and I wouldn't know. I just wish they let the seafood shine a little more in the dish. I guess that is partially my fault for not ordering fresh oysters. Wanting something fresh, we decided on the poached lobster salad. The dish was huge. 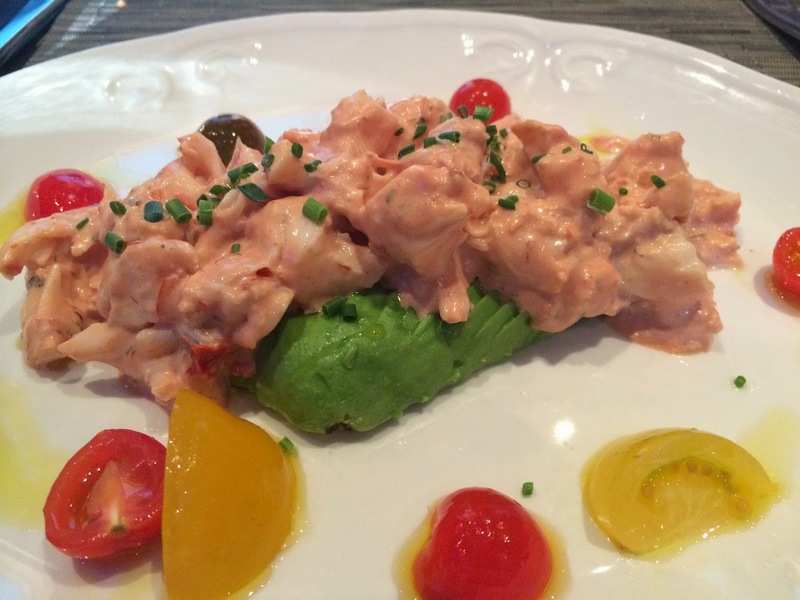 It was a large portion of poached lobster tossed in a Russian dressing and placed on top of a whole sliced avocado. Heirloom tomatoes garnished the plate with a little olive oil and chopped chives. The dish sounds appetizing, but man was it disappointing. The plentiful lobster could not make up for the excessive use of Russian dressing. In fact, all you could taste was that rich Russian dressing. It overwhelmed the entire dish and turned a fresh-sounding salad into something more fatty. I would pass on this dish. Our knowledgable waiter mentioned one of their specials with limited quantity. With only "3 fish" remaining, we decided to give the yellowtail snapper a try. It is served whole after being pan fried and drizzled with some citrus flavor. It comes with a side of broccolini cooked with roasted garlic and a lemon wedge. I found the fish to be perfectly cooked. It was tender, flaky, and extremely moist. The skin had the perfect amount of char and had a crispy texture to it. Pour some of the sauce on the fish and enjoy. 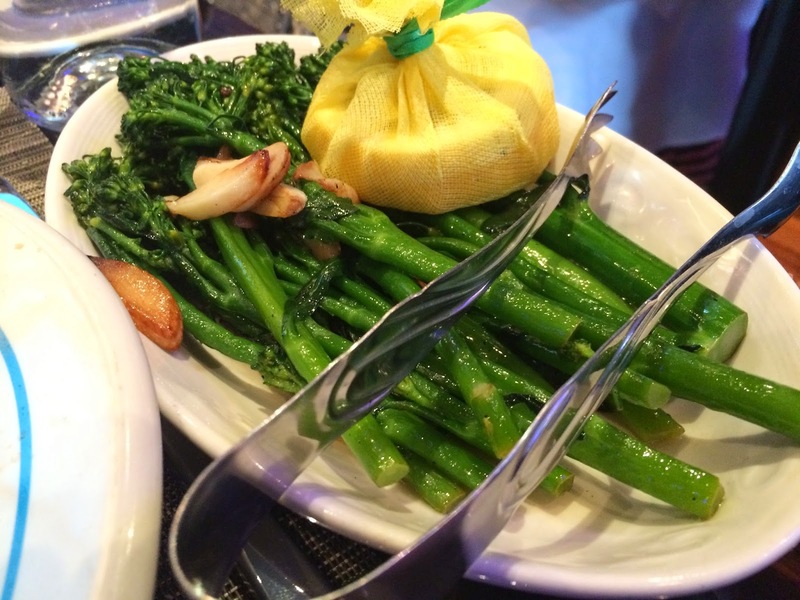 The broccolini was a great accompaniment, mainly because it also is complemented by the citrus flavors. And, for $40, I think this is the best fish option (reasonably priced and not an everyday fish) they offered that day. - I highly recommend making reservations here. We came on a Sunday night and it was PACKED. - Save room for dessert. They have a root beer float that we had to skip out on because we ordered too much. - I wouldn't rush here. The seafood is good, but the service is still being worked on and I thought it was definitely subpar for being a higher-end restaurant. Amuse bouche offered by Chef Joe.